If you are worried you or your child has head lice, being able to look at pictures of head lice can help properly diagnose a lice outbreak. The head lice pictures on this page will show you more than you probably ever cared to know about lice! And if you still want more information, we have an entire page on head lice questions & answers. However, if you are visiting this page, it is because you have a suspicion you have lice. If you are in Southern California and want lice gone today with absolutely no follow up, call us at (310) 990-1654. 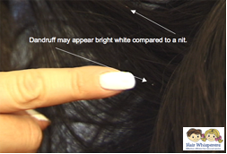 The images can assist you when determining if your child has live head lice or viable nits. 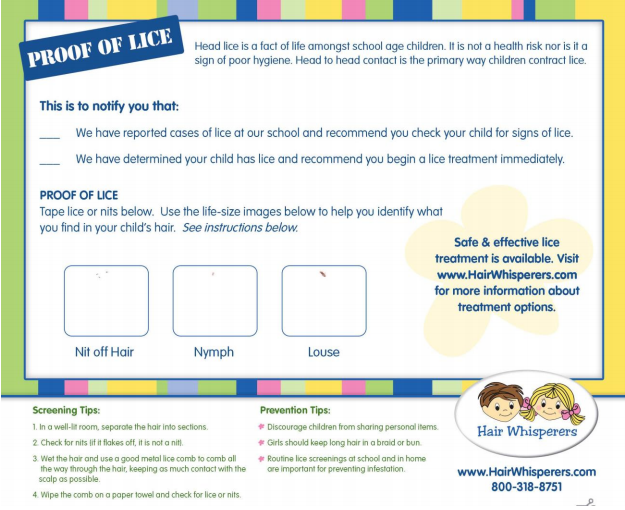 Use our helpful PROOF OF LICE card to compare debris you find in your child’s hair to life-size images of nits, nymphs and adult louse. This card includes screening and lice prevention tips. Head lice are tiny 2-4 mm wingless insects. They cannot fly or jump, but they can crawl. 24 hours after mating, female head lice lays her eggs (nits) on the hair shaft about 1/4-inch away from the scalp, although they can be found anywhere on the scalp. A nit is the egg of a louse, although people in some countries refer to all head lice as nits. Nits are tiny, shiny white, tan, to light grey eggs that are attached to one side of a hair shaft at an angle and do not come off easily. Nits are often confused with dandruff. If you can remove it or brush it out easily, it is not a nit. As you can see in the head lice picture above, the life cycle of a louse goes from egg to nymph to adult. They can be found anywhere, but are often found behind the ears and the nape of the neck, the warmer areas of the head, helping the louse to maintain its body temperature. Viable nits (eggs that are most likely to hatch) are found approximately 1/4 inch from the base of the hair shaft. Lice can live up to a month and can lay up to 10 eggs a day. An egg takes 7-10 days to hatch. A nymph is a baby louse. A nymph takes 7-10 days to mature into an adult louse. Only adults can lay eggs. The dark brown eggs are the newly laid eggs. Baby lice, or nymphs, are clear. As they get older, they take on a brownish color. They are extremely difficult to spot and are flush on the scalp. 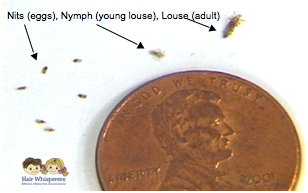 This lice picture shows an adult louse. Adult lice are the size of sesame seeds and pierce the skin with their needle-like mouths in order to feed. The louse will feed on human blood several time a day and live close to the human scalp are more active during the night. Lice move very quickly and can be difficult to spot, so be patient. 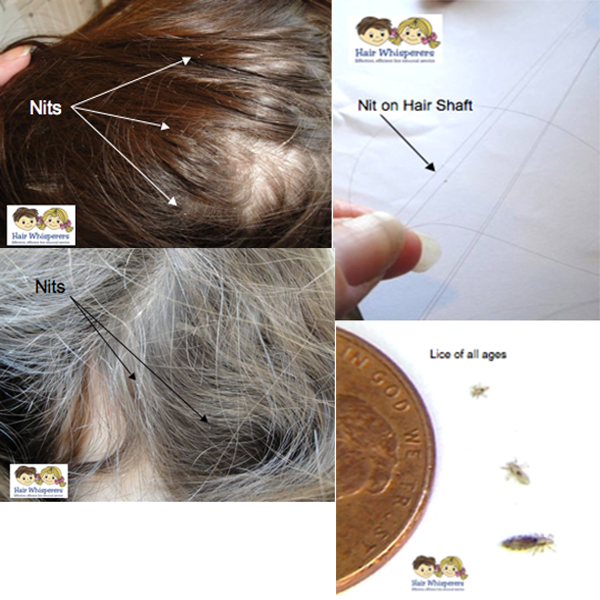 These head lice pictures show what nits look like in different types of hair. We also show stages of the louse. To get rid of lice, you need to correctly identify it, then select the best lice treatment. Want more? 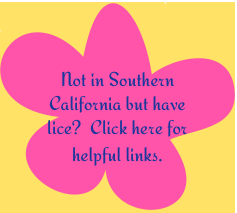 This page will tell you how to check for lice. And of course, we offer a guaranteed lice treatment and lice removal services – available nights, weekends, and in your own home!